I tried two varieties of these breakfast sandwiches: 1) The Sausage, Egg & Cheese Sandwich; and 2) The Veggie Scramble With Cheese Sandwich. 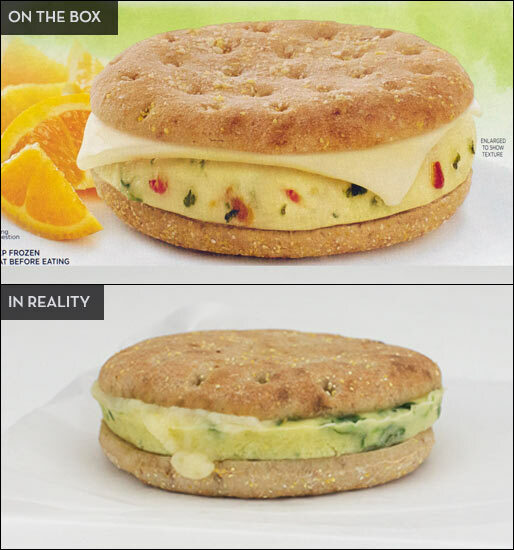 Both sandwiches are sandwiched between an "English muffin thin" made with whole grains. They're basically the same as thin buns (also called deli flats) that you see in the bread aisle. The bread won't remind you of an English muffin at all and it tends to get slightly chewy at the edges after microwaving. The Sausage, Egg & Cheese Sandwich is for fans of MorningStar's signature veggie sausage. The flavor of the sausage completely dominates this sandwich leaving barely a trace of cheese or egg flavor. The sausage patty is thinner than MorningStar's usual patties. I found myself wishing it was even thinner so that I could taste the other components of the sandwich. The Veggie Scramble With Cheese Sandwich was my favorite of the two. The egg, which is barely noticeable in the other sandwich, is very flavorful. There's a nicely seasoned fresh vegetable taste. Spinach is the vegetable you taste the most. Tomato is visible in the egg patty but contributes little to the overall flavor. Both sandwiches would benefit from more cheese. The pictures on the product packages are laughable in their presentation of cheese melting down the sides of the sandwiches. In reality, there's a very small slice of cheese under the bun that doesn't come close to spanning the width of the sausage patty. I'm a fan of many MorningStar products, but these sandwiches left me wanting more. I give the the sausage sandwich a score of 3 out of 7 and the veggie sandwich a score of 4 out of 7. Each MorningStar Sausage, Egg & Cheese Sandwich has 220 calories, 10 grams total fat (3.5 grams saturated and 0 grams trans), 70mg cholesterol, 670mg sodium, 20 grams total carbs, 4 grams dietary fiber, 1 gram sugar and 15 grams protein. Each MorningStar Veggie Scramble With Cheese Sandwich has 140 calories, 4.5 grams total fat (2 grams saturated and 0 grams trans), 10mg cholesterol, 530mg sodium, 18 grams total carbs, 3 grams dietary fiber, 1 gram sugar and 10 grams protein. 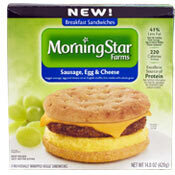 What do you think of MorningStar Breakfast Sandwiches? I love them and have for years. Having trouble finding the now. Grrrrrr. The bread gets way too hard. I have to cook the bread separately from the other items and every time I throw it away because it gets hard. There is no happy medium. You don't cook it enough and it stays frozen, and when you think you are not cooking that long it hardens. Will not be wasting my money on this again. So upsetting. The sausage has way too many spices in it. It's overwhelming. However, when you remove the sausage, it's way too bland. Not to mention the bread gets hard when you heat it up. The cheese also seems to disappear. One of my favorites. I always add a little more cheese. I think mouse meat would taste and be better for you than this chemical sausage they created. It tastes very nasty. 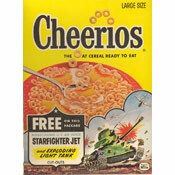 I picked up 2 boxes on sale for $1.50 each and would not buy again for 2 cents. In the trash, they will go. I thought these were very good. Tasted like a real sausage, egg and cheese sandwich to me. Low calorie too. I love these much more than the biscuits because they are much lower calories If I remember correctly. I especially love the faux sausage one! Tastes just like the non-vegetarian ones. My wife and I do not like the new breakfast sandwiches AT ALL. The old breakfast biscuits were vastly superior. They were moist, tasty and cheesy. These sandwiches are dry, rubbery and tasteless. Avoid. Did you ever have the old Morningstar breakfast biscuits? 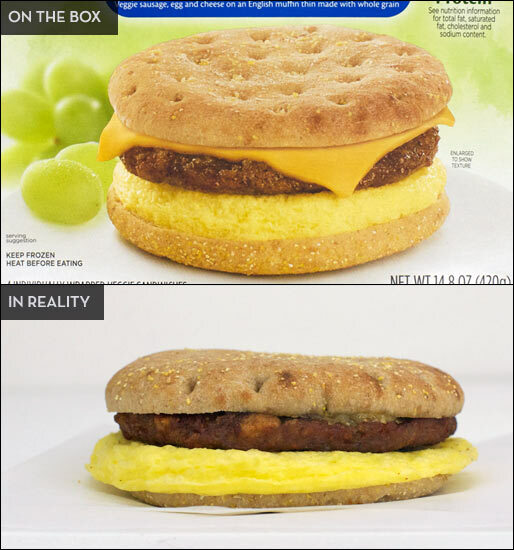 I find the new breakfast sandwiches dry and unsatisfying in comparison. The cheese is almost non-existent. I'd give the old product a "Very Good" rating, and I'd rather make my own then continue to buy these new sandwiches. They retail for significantly more here ($6! ), though you get an "extra" sandwich over the old biscuit product which gave you 3 biscuits over 4 sandwiches. My wife and I both agree it is an inferior product.